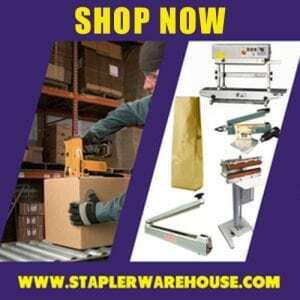 Manual plier staplers are commonly found at dry cleaners and store checkouts. They’re great for stapling receipts but they’re also useful for stapling small boxes, envelopes, bags, and tube caps. Our manual plier category offers a wide range of plier staplers, from light to heavy duty, plastic to chrome finish. But which tool is right for your application? It can sometimes be confusing choosing the right tool so we’ve made a little comparison chart to help with the selection process. Please note that the chart is by no means designed to answer every question you may have about plier staplers. We hope it will help ease the selection process by comparing a few basic specifications. This chart is still a work in progress and we hope to add more useful info. down the road. Please click to jump to view the chart.